I was spoiled with National Championship teams as well as stolen National Championships, which is STILL a major source of contention for me. Lou Holz won only one National Championship, but it is absolutely clear that he really should have won three! The infamous “phantom block in the back” during the 1989 Championship game and the ridiculous stolen Championship of 1993 (which was GIVEN to Florida State instead of Notre Dame eventhough the Irish beat the Seminoles near the end of the season). 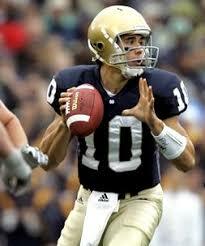 Being a Notre Dame fan was more than just rooting and cheering for the team. 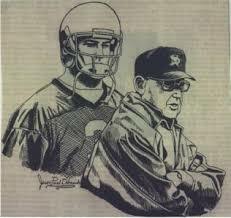 It was a way of life and the eventual success or failure of the Irish would dramatically affect my mood for the entire season (and in the cases of 1989 and 1993 it would carry over into the terribly long off-season). In fact, I can remember crying some tears when Boston College upset Notre Dame immediately after the monstrous victory over Florida State in 1993. I was in high school at the time and it wasn’t something that a lot of my peers could understand if I broadcasted the fact that I shed some tears over a college football game. I was miserable after that game and can remember being depressed for a very long time. My fit of depression wasn’t at all helped when the NCAA decided to allow Florida State to have the opportunity to play for the National Championship instead of Notre Dame. I have since had a salty taste in my mouth about the entire championship process in regards to college football. It’s obvious that there is a political nature involved, which undermines the efforts of the young men participating in the sport. I never understood how sports writers (guys who have more than likely NEVER played the game of football in their entire, nerdy, marching band lives) could be given so much power in determining the eventual national champion! It would be the equivilant of allowing federal prison inmates the absolute power of determining who our next Commander in Chief would be! It makes no sense, has never made sense, and continues to make no sense nearly twenty years later! 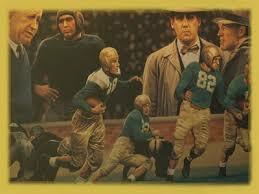 The current Notre Dame football team is no more important to me than the Lou Holz teams of “yesterday”. I still love them and follow them intently. They are my team! I am true Gold and Blue…through and through; and it matters not if we’re a title contender or a cellar dweller. 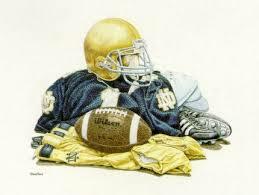 However, it has been a lifetime of being a Notre Dame football fan that has spoiled me with the fruits of success. Simply stated, there has always been a competitive team in South Bend, Indiana. Just recently, the Fightin’ Irish have been to three BCS Bowl Games in the past six years, which is something that not too many other programs can say! If you go back to the Bob Davie era then we’ve been in four BCS Bowl Games in the past eight years! Success has always been a part of Notre Dame football, but it seems that those spoils of war are temporarily set aside and replaced with the fruits of humility. There’s no easy way for me to say it, but I’ve never seen a Fightin’ Irish team quite like the one we currently have up in South Bend right now. They’re slow, young, inexperienced, out-manned, out-coached, and weak in comparison to nearly every single other college football program. In fact, I think we would be hard-pressed to expect a victory against Ball State, Indiana, or even Valporaiso! It’s something that I’m not used to and I can’t say that I enjoy it. However, it something that I can appreciate because it’s something that other teams have experienced only too often. I guess that the level of humility I’m being dealt is something that can only strengthen me in the long run and I’m praying that this is the same outlook that the players of Notre Dame have. It would be a folly and a shame for anyone to expect this type of team in the future, but it would likewise be a folly to expect the current crop of Fightin’ Irish football players to produce any more than three wins by the time the season is over. In football, the glory always goes to the position players. Quarterbacks have always been the most popular players on any team, but without a good offensive line then the quarterback will be absolutely nothing. Football is the only true team sport left in the world because the success of every play is dependent upon eleven players flawlessly executing their individual assignments. In fact, many football fans (and experts alike) would go as far as saying that the offensive and defensive lines are the absolute most important feature to any successful team. 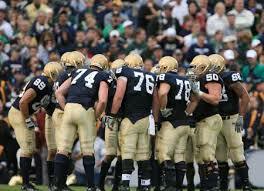 Right now, Notre Dame has the absolute worst offensive line I’ve ever seen. Forget the fact that they’re a young offensive line and that we lost most of last year’s players to the NFL draft or graduation. The simple fact of the matter is that they are completely out-manned on the line of scrimmage; being pushed around like little girls; unable to accomplish their individual and collective assignments. Without a solid control of the line of scrimmage it is a toss-up whether or not a football team will even win a single game. Even Joe Montana himself couldn’t be successful behind the current offensive line of Notre Dame! Notre Dame fans…prepare yourself. Get the idea in your head that your current group of football players won’t be going to a Bowl Game this year and they might not even win a single game (although playing Duke, Navy, and Air Force doesn’t hurt your chances). When you lose 9 starters and replace them with 7 Freshmen it is more than highly unlikely that any semblence of success will be the result especially when you’re up against a brutal (yet typical) Notre Dame schedule. In our first eight games, the Fightin’ Irish will play: Georgia Tech, Penn State, Michigan, Michigan State, Purdue, UCLA, Boston College, and USC. Heck, even with last year’s team it would still be likely that the Irish would lose at least two or three of these matchups! It must be stated, however, that the ongoing strength of schedule that Notre Dame is up against each and every year is something that I deeply respect. While other schools are wasting time playing Eastern Michigan, Western Kentucky, and the Citadel; Notre Dame is playing the big boys of the major college conferences. I can appreciate and respect that deeply. It’s going to be a very difficult year, boys and girls. Other teams might as well put a thumping on the Irish this year because they know it, I know it, and you know it…the Fightin’ Irish are NOT going to be this bad next season. 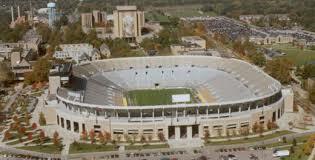 The experience that these young players are gaining this year is only going to expedite their evolution into true Notre Dame football players. I would even go as far to say that a National Championship is on the horizon for these guys! I look forward to the future because the present is very, very ugly.